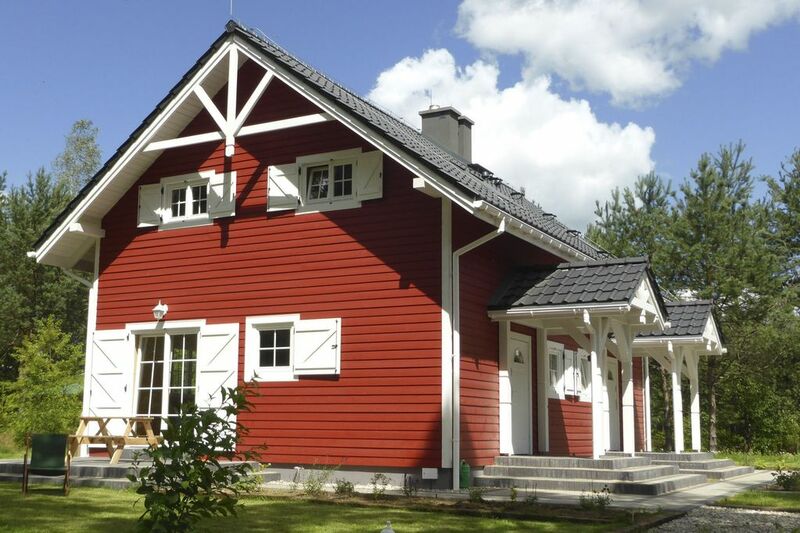 The house consists of two independent cottages designed for year-round comfortable rest. Each cottage is 80 m2 of tastefully and modernly designed space, ideal for four people: - large, bright living room with ceramic stove, sofa and TV, leading to the terrace - Fully equipped kitchen with dining area - two bedrooms (one double and two single beds, linen provided), - bathroom with shower (towels provided). Each of the 2 cottages has its own entrance, gate, parking for one car and a private 800 m2 wooded garden with sun loungers, hammocks, picnic and grill facilities, perfect for nature, away from the city and stress. Ground floor: Living room (TV, ceramic stove, sitting corner, dining table), Kitchen (stove, kettle, microwave, dishwasher, fridge with a freezer), bathroom (shower, washbasin, toilet, hair-dryer) On 1st floor: bedroom (double bed), bedroom (2x single beds). Grill, terrace, garden, garden furniture, parking, deckchairs, hammock.